Newham Council tries to intimidate the Focus E15 Campaign. The Focus E15 campaign is appalled by the recent bullying tactics of Newham Labour council and the police who worked hand in hand to intimidate peaceful housing protesters involved in the ‘Jane Come Home’ political occupation. We proudly stand by Jane Wood who bravely reoccupied her home on Saturday 11 April after being tossed aside by Newham council. The flat was raided by police on Monday 13 April. It is clear that by arresting Jasmin Stone, one of the most prominent members of our campaign, the authorities in Newham are trying to intimidate us. Jane Wood, a Newham resident, was evicted from her flat by the council on the 24 of March alongside her 14 year old daughter. The eviction was a terrible shock for Jane, she had been living in the flat for 21 years. Now she was homeless. Jane decided that the only way that Newham council would listen to her was if she took direct action. On Saturday 11 April, with chants of ‘Jane Come Home’, we marched to a house-warming party in Jane’s old flat. The brief occupation of the flat was a joyfully defiant gesture attracting press attention. Jane was deeply touched by the support from the community around her who were quick to show their solidarity by bringing all types of food, furniture and cooking equipment into the occupied flat. Jane Come Home. Stop the evictions! On the same day the local Labour MP, Lyn Brown, responding to growing pressure, tweeted that Jane should phone her. Jane did, twice, but only got an answermachine. By Monday 13 April the authorities in Newham were furious and running scared of the powerful message of direct action embodied by Jane and the other campaigners. The council then acted in the most underhand way possible: they asked Jane to attend a housing appointment, whilst at the same time unleashing police and council officials in order to break into the flat. A terrifying ordeal for the people left inside the flat. After over ten minutes of violence, smashing through the front door, with children screaming, the police began intimidating the women – aggressive and threatening to take the children into care. It was at this point that Jasmin Stone from Focus E15 was arrested inside the flat, on suspicion of squatting, a ridiculous charge on many fronts especially when considering the council knows exactly where Jasmin lives. We have been advised that the police and council have acted unlawfully: they did not acquire a possession order from a court to enter the flat. Jane may also have had some rights as a former tenant but Newham Labour council just wanted to shut down the protest by any means possible. Fast. Jasmin was taken in an unmarked police car to Waltham Forest Custody Centre outside which a growing crowd gathered. A banner was unfurled with the clear message ‘Free Jasmin Stone – Let Jane Come Home’. Whilst the solicitor negotiated inside, Focus E15 campaign supporters chanted, danced and sang outside. 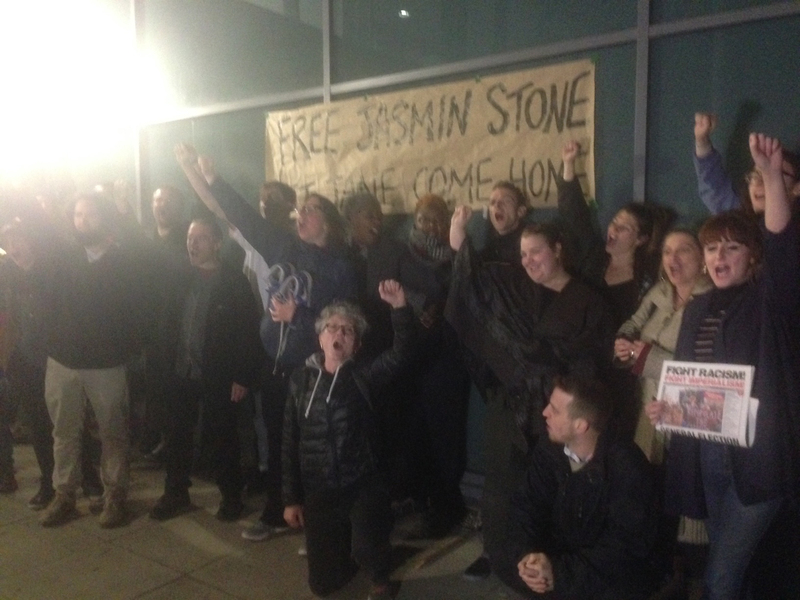 Jasmin was greeted with a huge cheer when she stepped free from the custody centre, bailed pending further enquiries to a date in mid May and banned from attending Jane’s former flat, a clear sign of the political nature of this arrest. What about Jane? Jane’s first offer from the council was an uninhabitable temporary flat in a neighbouring borough that she rejected as unfit for her and her teenage daughter to live in. By the time of the next discussion with the council housing department, the staff had obviously seen the news and read the papers and started to make offers of a longer term council tenancy, this is yet to be confirmed. The campaign is overwhelmed by all the support that has come flooding in since Jane’s second eviction and Jasmin’s release. Thank you to all those who have sent messages of solidarity. We will not be shaken in our belief that housing is a human right. Everyone deserves a decent home to live in. Keep up the fight. Thousands support you. Newham Labour need to hang their collective heads in shame. Close, on the 5th Floor. This was in the mid 80’s. Then in the early 90’s we all had to move out because a new housing scheme was going to be built: Focus E15. Thanks for sharing that history. Regeneration is a story of displacement, when what we need is long term, secure decent homes for all.